It can’t get any easier or yummier than this. I found this recipe on Everyday Kitchen. It takes all of two minutes to throw in the crockpot and later you come home to a delicious dinner. You’ve got to love a recipe with only 4 ingredients! And they can all be kept on hand for those days when you just don’t know what to make. Put all the ingredients in the crockpot and cook 6-8 hours on low or 4-6 on high. Don’t over cook this! I made that mistake recently, and it was okay, but a bit salty. It tasted much better when I didn’t over cook it. 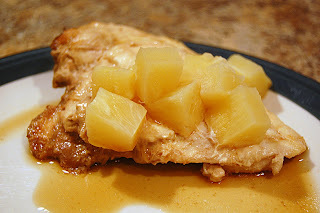 *Note* – To avoid overcooking the pineapple, drain the juice off and reserve the pineapples until later. 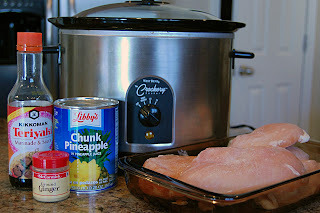 Go ahead and put the juice in the crockpot, but don’t add the pineapples until you are finishing up the rest of your dinner. That way they will be warm, but not fully soaked of Teriyaki sauce, which makes them taste too salty. Well, yummmm! That sounds like something I’ll have to add to my menu for next week. Certainly can’t beat how easy it is! I am definitely gonna try this one! I love easy crockpot recipes! Do you think it would taste way different w/o the ginger? I’m not a huge ginger fan. This sounds delicious, I love crockpot recipes – they make life so much easier. I’ve got everything except for the teriyaki…it’s on my shopping list as of NOW. Yaya, I think leaving the ginger out of this one would be ok. It’s not much ginger to begin with so I don’t think it would hurt it to leave it out. Now I have something to keep in mind for that chicken in the fridge that needs to be cooked when I have nothing to go with it! How easy. Thanks! This looks so easy – I think I can handle this! I love a good crockpot recipe and this looks delicious. Thanks! I am going to go try this right now – looks yummy! This is in the crockpot now. I can’t wait to get home! I just did this today! It was really good. With my 3 boys it’s difficult to find a crockpot meal that they will eat. My oldest (and pickiest) nodded and said it wasn’t bad, this is a good thing. He normally hates crockpot meals! Good idea about the pineapple! I had never thought about doing that before, because I dislike rubbery pineapple! Your site is the greatest!!! My kids are picky in trying new recipes and they sure love this recipes. Thank you!!!! can you do this recipe with frozen chicken and how long to cook? Misty, you can make this with frozen chicken. I’d probably cook it for about 7 hours. this looks delicious! my bf loves teriyaki anything!! do you think it would be good with broccoli? Britney, I’m glad they liked it. It’s one our favorites too. Rest up from the surgery! Hope you’re feeling better soon. I’ve been having compilations not from the surgery but from other things. I’m suppose to be on the soft foods timeline but I’m still on liquids. Im just ready to eat a normal meal. Thanks for the comment!